No Myrrh, Thanks. Wrong Star… | Wilton Lights! 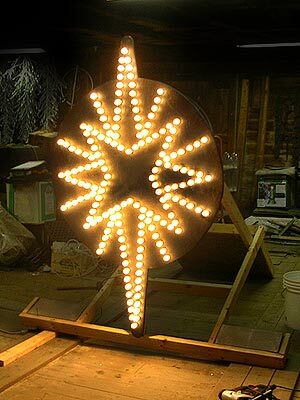 We’ve just installed the 6 foot tall Bethlehem Star on the roof. It’s insanely bright and illuminates most of the yard. If you’re driving by we’ll have a simple animation running on it until it’s time to turn everything else on (Dec 6th).